Don’t miss the one day of the year when you get to run on the runway. Join us on Memorial Day weekend at the Greenville Downtown Airport. Register today for the 7th Annual Take Flight 5k to raise money for our local aviation themed community park. Run or walk down a Greenville Downtown Airport runway. Participants of all ages will taxi to the runway to be cleared for takeoff. Join us for Take Flight 5k – 2019. Packet Pick up will be Friday the 24th from 4-8pm @ the Runway Café and race morning beginning @ 7am. Late registration can also happen here too. 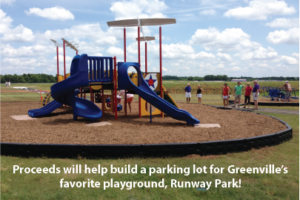 For sponsor information contact Lara Kaufmann: Lara@GreenvilleDowntownAirport.com.